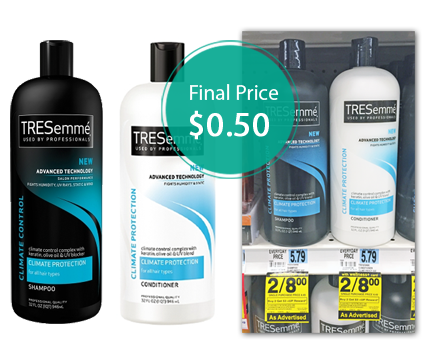 Stock up on Tresemme shampoo and conditioner at Rite Aid! Buy two Tresemme shampoos or conditioners. Pay $4.00 out of pocket and receive a $3.00 +Up Reward. Note: This is the same promotion as the Tresemme stylers that we posted about earlier this week. Remember, there is a limit of four +Up Rewards. Total $4.00 plus receive (1) $3.00 Up Reward, making them only $1 or 50¢ each after coupons and UPR!